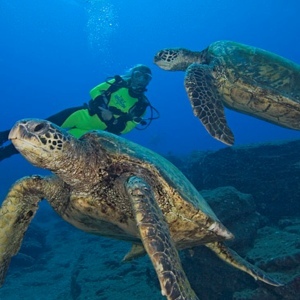 Alii Nui’s Snorkel Sail Deluxe offers snorkel stops at two of Maui’s most vibrant reefs, Molokini crater and Turtle Arches in South Maui. All snorkeling equipment is provided complimentary including optical masks and wet suits. Also included as regular amenities are boogie boards, water noodles, wet suit tops, reef-safe sunscreen and large terry beach towels.